I began the art of weaving with Cedar Bark in 1992 with a desire to recreate the traditional rain hats that my coastal ancestors had developed. My wolf clan father was walking out of the forest with several freshly harvested Cedar bark bundles upon his back. He stopped me as I walked to school that day and he said that when I return home that he will teach me how to clean and process the bark. I followed his instructions that night and his precious bark strip was full of holes from my cleaning method. He was not disappointed…He showed me the process again and away I went with a passion for weaving. I have since created over 100 traditional rain hats and I learn a new method every time I weave. When I first began weaving, I had an old wicker basket to study from. The traditional weavers of the Nass River Valley has already passed into the spirit realm. I have called upon their energy and wisdom and feel that they have initiated my desire to weave. Weaving Cedar bark hats is my gift. Each year since learning to harvest Cedar bark from my father, I have promised to teach one other person how to harvest, process and weave with the bark providing that they in turn will also teach one other person. What this has done is created a blessing wave of weavers who have moved on into great success and have become teachers in their own right. Weaving with cedar bark hats is alive and well again in the Nass River Valley. My hope is that it will continue to develop and grow into a great and powerful healing process for all who encounter its sacredness. I am born into the Orca Clan from the Fire-weed fortress family of the upper Nass River Valley. I grew up in the Nisga’a Nation communities of Laxgalts’ap and Gitlaxt’aamiks. My passion is weaving with Cedar Bark. 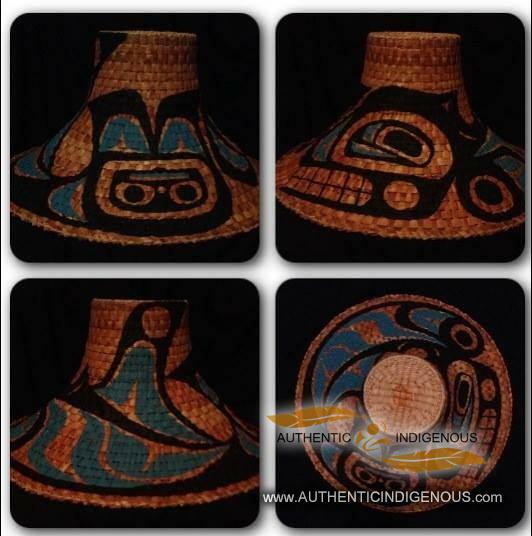 I have developed and learned several styles of patterns according to the Old style hats as made by my coastal ancestors. I also paint upon the hats in the coastal form line style of art. I also create appliqued dance robes and regalia to accompany the hats that I create. The area that I come from is called the Nass River Valley and the style of work that I create reflects the NISGA’A style of coastal artwork. At the young age of ten, I learned that I was Aboriginal; It ignited a passion in me to connect to my identity as an aboriginal person. My desire to recreate the Old museum collected and sacred items from my Ancestral lands has been the driving force behind my creativity. I feel at peace when I create a new ceremonial piece. My hope is that the items that come into life from my hands and energy will continue to live on to inspire others and ignite a deep sense of belonging and purpose. I have wonderful and virtuous speaking elders and relatives in my walk upon this earth realm. I have been given great guidance and affirmations through family functions, community gatherings and walks throughout the communities of my ancestral valley. The potlatch practice of my clan has been a great wealth of infusion of knowledge about our aboriginal customs and values. I am very pleased with my father, who in my young growing days would insist that I tag along with him as he visited and worked for the elders of our community. It was then that I truly learned and appreciated the wisdom of our people. Those sacred visits shaped my outlook upon the world and my being. The work that I create is unique. It is infused with positive energy and blessings. The grandmothers of my time have shared with me that when I sit down to create an item for another, that it must be done in great reverence and tranquility. I was told that the finished product will serve a medicine for those who receive it. My work is also a statement to the world that Aboriginal customs and practices are alive and well. The pathway of the children that follow behind me is what inspires me. I must, in my walk, create a positive outlook, a safe walkway for the children of tomorrow. They are the true hope and dream for the continuation of our earthly existence. We have great edicts of life that have been entrusted to us through our elders and ancestors…we have a duty to uphold that sacred knowledge.